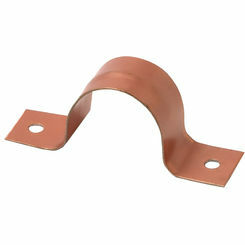 STRC114 1-1/4" Copper Strap. Copper Strap is typically used in systems such as potable water, air conditioning and refrigeration. This STRC114 1-1/4" Copper Strap is designed to secure the pipe, and allow the pipe to be mounted to walls, joists and rafters. The Copper Strap features two mounting holes that can be secured using both nails and screws. In addition to its qualities of security, durability and low maintenance, this STRC114 1-1/4" Copper Strap's re-usability makes it an ideal product for residential, commercial and industrial applications. The strap is designed for use in Above ground water supply piping. This Strap is copper coated, and is intended for use with copper, PVC, CPVC, galvanized, polybutylene and other piping systems.